Edelbrock E-Force Supercharger systems deliver excellent horsepower and torque in a complete, street-legal kit that fits under the factory hood. The core of each system is the Eaton Gen VI 2300 TVS® Supercharger rotating assembly. Eaton’s assembly features a four lobe design with 160° of twist for maximum flow, minimum temperature rise and quiet operation for excellent drivability. The supercharger assembly has been integrated into the intake manifold for a seamless design with minimal components, eliminating the possibility of vacuum leaks between gasket surfaces. Edelbrock’s inverted supercharger assembly is uniquely oriented, allowing for an incredible amount of intake runner length for maximizing low end torque. An integrated bypass valve helps eliminate parasitic loss under light throttle for improved mileage potential. 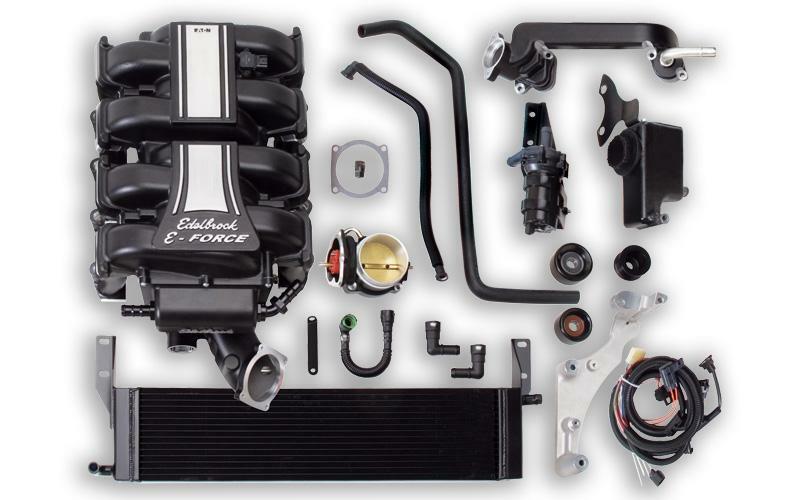 E-Force superchargers feature the most unique and efficient inlet configuration on the market. This results in a shorter, less restrictive intake path for improved air flow, without the need for a jack-shaft. Keeping the air cool is a high capacity air to water intercooler and low temp heat exchanger. Finally… the Edelbrock E-Force Supercharger system is not just a performance upgrade, it also has great looks! The supercharger assembly and matching aluminum coil covers (on applicable systems) are black powdered coated for durability with highlighted fins and Edelbrock logo for a unique appearance that will give any engine compartment a custom look.